As part of my effort to practice medicine based solidly in scientific evidence, I regularly review my own practices and recommendations and make adjustments as seems indicated by new evidence. The quantity and quality of scientific research in veterinary medicine is often less than ideal, so absolute right or wrong answers are seldom clear. But over time changes in the available evidence sometimes justify changes in practice. One area in which this has been particularly true in the more than 15 years since I started in vet school is the subject of vaccinations for dogs and cats. Unfortunately, the vaccination issue is all too often taken out of the realm of rational, science-based discussion and made part of ideological battles over different approaches to medicine that have little to do with a sound assessment of the risks and benefits of vaccines. This is unfortunate and unnecessary, but given the politicized nature of this topic, I will begin by stating my basic perspective before getting into the details. I believe vaccines are one of the most successful and beneficial healthcare interventions ever developed. Like any real medicine, vaccines have risks as well as benefits, but history is unequivocal that vaccines have saved and improved the lives of humans and animals to a degree that dramatically overshadows any harm they have done. Most of the opposition to vaccination in the last decade, for children as well as for pets, has been irrational, unscientific, and pretty thoroughly baseless. The kinds of dangerously misguided and misinformed anti-vaccine positions of all too many proponents of alternative medicine are not based in science and represent a serious threat to the health of our pets. With all of that said, the mainstream veterinary approach to vaccination has often not been soundly based in science either. Habit, inertia, and economic considerations have led some vets to ignore growing scientific evidence and continue giving some vaccines more frequently than necessary. The latest data I have been able to find, which is from 2006, suggests up to a third of small animal vets give certain core vaccines more often than is recommended (I’ll get into the details in a bit). This is far fewer than the majority sometimes claimed by critics of science-based medicine, but it is still an illustration of the resistance to change in routine practices even when good evidence supports the change. 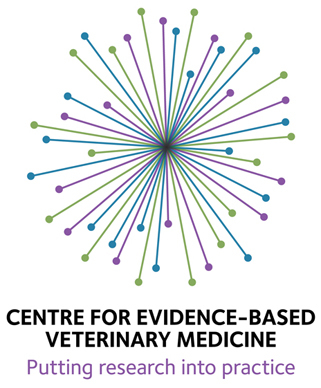 So what does the evidence say about vaccinations for dogs and cats? What should they be vaccinated for? With which vaccines? How often? Not surprisingly, these are complicated questions with complicated, nuanced answers. Simple, one-size-fits-all rules may be convenient, but they don’t reflect the complex nature of biology. The best review so far of vaccination research concerning dogs is the 2011 American Animal Hospital Association Guidelines on Canine Vaccinations. For cats, the 2013 American Association of Feline Practitioners Vaccination Advisory Panel Report is a useful document. Both of these are consensus statements issued by a limited group of experts, and they don’t meet the standards of a fully transparent, systematic review of the evidence. But they do provide a good summary of existing research and a reasonable interpretation of the how the research might translate in vaccination practices. Vaccination, like any medical therapy, needs to address the specific needs of the individual patient. One cannot make a decision about which diseases to vaccinate against until one has some understanding of which diseases a patient is at risk of getting. This involves considerations such as age, exposure to other animals, general health, and so on. Unfortunately, the specific risk of a particular disease in a given setting is not always known since there are no regular, systematic or comprehensive surveys of how common most cat and dog diseases are everywhere in the country. However, some general guidelines and the experience of practitioners in a given area can help give a crude idea of whether a particular patient is likely to be at risk for a particular disease and to benefit from vaccination for it. The AAHA guidelines for dogs categorizes vaccines as core, those that are most likely to be widely beneficial, because the diseases they protect against are common, and non-core, those which are only appropriate for dogs with specific know risk factors for a particular disease. The guidelines also assess the general efficacy and safety of particular vaccines and the available information on duration of protection, which helps us decide how often to repeat particular vaccines. Based on this information, most puppies should have a series of vaccinations for canine distemper and parvovirus every 3-4 weeks from about 6 weeks of age to 16-18 weeks of age, one rabies vaccination after 12 weeks of age and boosters for these one year after the last in the puppy series. Duration of protection is at least 3 years for most licensed canine rabies vaccines, and they are legally required in most places every three years for life. From a medical point of view, a reasonable argument can be made for less frequent rabies vaccination or for alternatives, such as monitoring antibody titers. But in most cases these alternatives are not legally permitted. This is a function of the fact that rabies is widely present in wildlife and nearly 100% fatal for humans (and all other mammals) who catch it, so the public health authorities choose to err on the side of caution when using vaccines to prevent transmission from dogs to humans. Some research efforts are under way to try and support changes in these laws, so these rules may be altered at some point. However, it is important to remember that while the evidence suggests less frequent vaccination for rabies might be effective in protecting dogs (and humans), it also suggests that the current guidelines of revaccination every three years is safe and very, very unlikely to harm most dogs. While I would welcome an evidence-based change in the rules regarding rabies vaccination intervals, I do not think there are risks that justify defying the rules in the meantime. For distemper and parvovirus, the other core vaccines, there is strong evidence that protection for most dogs lasts at least 5 years, and pretty good evidence for longer duration of immunity. The guidelines recommend repeating vaccination no more than every 3 years, and 3 years is the interval most commonly used today. However, longer intervals are probably justified. There is certainly no need for annual boosters, and this is a practice that really isn’t defensible scientifically. Antibody titers can be useful in some cases, since a high titer does indicate a dog is protected and does not require additional vaccination. However, a low titer does not necessarily mean a dog is susceptible, so it is less useful in trying to decide when to revaccinate. Given the length of protection, and some evidence that susceptibility to parvovirus is low in older dogs, most probably do not need to be vaccinated after about 8-10 years of age. There is clear evidence that older dogs do respond appropriately to vaccinations, and there is not evidence that they are more likely to be harmed by vaccines than younger dogs, so continuing to vaccinate after this age is not likely to be harmful, but it is probably unnecessary. In humans, there is evidence that older people may be more susceptible to some diseases than younger adults, and thus may be more in need of vaccination, but this hasn’t yet been demonstrated in dogs. Given the degree of safety for most of these vaccines, if there is significant uncertainty about whether a given dog is protected or has had appropriate vaccination for these diseases, giving the vaccine is safer than not giving it. 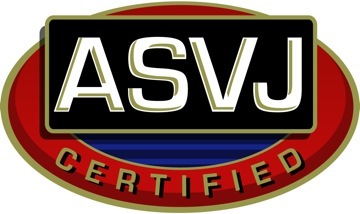 The AAHA guidelines cover in detail many of the other available vaccines. Most are not regularly recommended, usually because the diseases they protect against are mild or uncommon or because the vaccines are of poor or uncertain effectiveness. Some are quite controversial, such as that for Lyme Disease. Most are only appropriate for dogs with particular risk factors, not for routine use on all dogs. The AAFP guidelines for cats are similar to the AAHA canine recommendations, identifying core and non-core vaccines and providing general guidelines for use of these as well as suggestions for how to develop individualized vaccination recommendations. Most cats should have a series of vaccines for feline herpes virus (FHV) and calicivirus (FCV) and panleukopenia (FPV) between 6 and 20 weeks of age and boosters for this one year later. Thereafter, 3-year intervals are recommended for life, though there are a variety of factors that may alter this plan. Feline leukemia vaccination is also recommended for most cats. While many indoor only cats may not be exposed to this disease, the recommendation is for all cats to have an initial vaccine and one year booster because it is not always possible to predict future lifestyle or exposure status for kittens. Boosters are recommended every 1-2 years depending on risk of exposure. Recommendations for other vaccines depend on the needs of individual cats. Other vaccines are assessed on a case-by-case basis. In general, I recommend following these guidelines for the initial vaccine series and the one year booster. I often cease vaccination for strictly indoor cats after that, however this involves a thorough discussion of the possible risks. If a cat escapes every once in a while, for example, they should certainly be kept current on rabies vaccination. And, of course, if there are legal requirements for rabies vaccination, these should be followed. Cats that visit other cats or have visitors or new cats come into the household, cats who attend shows or are boarded, and cats with owners who interact with cats outside the household may benefit from vaccination even if they are strictly indoors. The risks of vaccination are generally similar in cats as in dogs, and very small, with one significant exception. The evidence is stronger for the development of a very serious kind of cancer, called a sarcoma, associated with some vaccines in some cats. The risk of this is still very low (reported to occur following as few as 1/10,000 doses of vaccine to as high as 36/10,000 doses), but it is a very dangerous and often fatal disease. Changes have been made in the vaccine used in cats to try and reduce this risk, but it isn’t absolutely clear if these changes have lowered the risk. This disease needs to be considered when making vaccination decisions for individual cats, and certainly we need to make a serious effort to avoid unnecessary vaccination. However, irrational fear of this disease is not a good reason to subject cats to unnecessary risk from equally serious infectious diseases by avoiding appropriate vaccinations. Because the scientific evidence is never perfect or complete, it is not unusual for different individuals to have different interpretations of it, and more than one of these may well be reasonable and appropriate. For example, I tend to recommend distemper and parvo boosters every five years, but there is nothing wrong with recommending these every three years. On the other hand, the evidence is often sufficient to make some interpretation unreasonable. Annual boosters for these vaccines are almost never justified, and complete avoidance of them, or refusal to vaccinate adult dogs is not sound medical practice. The evidence may not always provide a single right answer, but it can help establish a range of reasonable options from which to choose. My own vaccination practices have changed significantly during my career as a result of both changes in the evidence and new assessments of existing studies. The practice of evidence-based medicine requires regular re-assessment of the interventions we offer. Unlike in some domains, such as politics, changing one’s mind in science is understood to be a good sign, and indication that a good clinician is committed to providing the best science-based care possible. I always emphasize in this blog that our patients and clients deserve the best care, and that care is going to be treatments for which we have as much scientific evidence as possible to understand the real risks and benefits. This applies to all veterinary interventions, conventional as well as alternative. I tend to focus on alternative therapies here partly because there is so little skeptical, critical information about them available to help pet owners make informed decisions and also because, frankly, they are quite often far less founded in science-based theory and evidence than conventional approaches. However, the same scientific standards of evidence should apply to all treatments regardless of their provenance. Accepted conventional practices need to be scrutinized as closely as alternative therapies. When there is some uncertainty about the evidence, I endeavor to apply this scrutiny just as I do for unconventional treatments. My articles concerning neutering, cruciate ligament disease, and stem cell therapy, in addition to this and previous discussions of vaccination, are examples of this. Since my position on vaccines tends to be very similar to that of many proponents of alternative therapies, I thought it would be useful to discuss it explicitly here. There is a tendency to caricature and demonize those with whom we disagree on issues we feel strongly about. It is often assumed, for example, that I blindly give all dogs annual vaccinations because this is a stereotype image of veterinarians who are critical of alternative therapies. But of course a science-based evaluation of an intervention like vaccination can and should be every bit as thoughtful and focused on the needs of the individual and the risks and benefits of the intervention as alternative practitioners claim they are. I believe the science does not support annual boosters for core canine vaccines, so I no longer recommend them. Similarly, it is tempting to assume all proponents of alternative therapies hold the most extreme anti-vaccine views espoused by members of their community, but that is likely inaccurate and unfair also. I see no reason to shy away from points of agreement with folks on some issues even when one has serious disagreement with them on others. Hopefully, such points of agreement might even act as bridges to allow more realistic and respectful communication and disagreement, though my experiences in this area haven’t led me to be very optimistic about that. In any case, it happens that I often agree with the criticism of vaccination practices put forward by proponents of alternative medicine, if not always on the basis of the same reasoning or evidence. This will likely neither tarnish my credibility with skeptics nor improve it with proponents of alternative medicine, but hopefully it will illustrate that I am committed to following the evidence over ideology as best I can. I’m currently trying to make this decision for a couple of older dogs- one with no spleen, one with lung disease. So presumably the answer would be that they should be revaccinated with the ordinary 5 in 1 but that bordatella is not worth it for rapidly decreasing protection? Ordinary exposure to other dogs- they go to the park, go out on walks etc. I’ve been looking at the information hand-outs from the vet, which are good but they recommend annual revaccination, which is not consistent with what I have read elsewhere. The dogs haven’t been vaccinated in years- time just gets away from you. Suddenly your young dog has a white muzzle and is pottering rather than bounding along. Thank you so much for this website by the way! There’s so much information out there and it’s hard to make sense out of it sometimes. I’ve been just searching ‘vaccines’ here and working my way through the results. In general, I recommend continuing rabies vaccination every 3 years. I tend not to recommend the 5-in-1 after about 8-10 years of age if the dogs have been previously vaccinated since the evidence suggests virtually no susceptibility to these diseases at this age. A titer can confirm immunity, though even if it is negative this may not mean the dog is susceptible. Bordatella is one of the common causes of infectious respiratory disease in dogs, though there are several others. It provides roughly 80% protection but only for a few months. This may be worthwhile if there is regular exposure to groups of dogs (daycare, dog parks, boarding, grooming, shows, etc), though the dogs can still get other respiratory infections. glad you found the site useful! I just read an interesting post over at the homeopathic site regarding a dog bite and the rabies vaccine. A warning about what can go wrong. I imagine it may be removed. Would you like to share which article or site this is? Yes, this guy is a serious danger to public health, human and animal. Even most alternative vets disagree with his extreme stance. And yet it seems impossible to do anything to prevent him from inflicting his dangerous delusions on the public. Very frustrating. Yes, your site has been very helpful to me, I have a terrier that had a rough start so I was hesitant to go along with the vaccines ….but I will do what is required by law. Thanks. Dogs vaccinated today, many thanks for the advice. It’s weird how confusing attempting to figure out these things can be, when even seemingly-reputable sources will advise quackery (or just outdated advice)- or perhaps when quacks are so good at seeming reputable. And I am used to reading scientific papers in other areas, routinely skeptical etc. Your site has been very helpful . Thanks For sharing information. I really, really wish I’d found this post–or something similar, lol–5 years ago. Thanks. As others have said, I thank you for your article! Can you add any more info about the “non responders” and influence of maternal antibodies? Repeat titer at 15.5 weeks still showed sub optimal parvo and was revaccinated- Holistic Vet seemed perplexed and discounted my comments about maternal antibodies. Maternal antibodies obtained from colostrum readily block the effects of modified-live vaccines such as that fro Canine Parvo Virus (CPV). 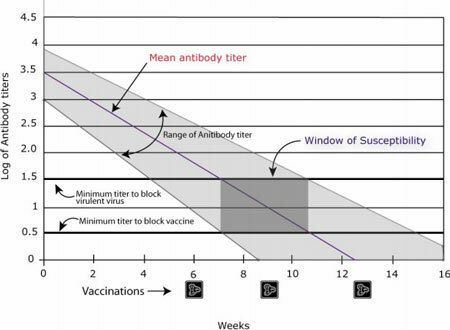 The level of maternal antibody that can block the vaccine is actually lower than the level needed to protect against the disease, so there is a window of susceptibility for pups with this disease in which they are not protected by maternal antibodies but still have enough to block immunization and the production of their own antibodies. The more antibodies they got from the mother, the longer this period lasts. For this reason, CPV vaccines may not be effective until 16-20 weeks of age, which is why the final CPV vaccine is usually given after 16 weeks and sometimes later in areas with high CPV prevalence or in breeds with potentially higher susceptibility. You can find a lot more information about this in the AAHA Vaccination Guidelines.